Pixar does something new with their first feature focusing on a female lead character. 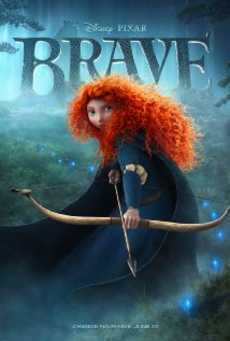 Brave gives the Pixar studio another notch in its win column. They do not disappoint when it comes to the pains taking detailed world of medieval Scotland. From a technical standpoint this movie does an outstanding job of bringing to life these animated characters in a very fluid, lifelike smoothness. The 3D Aspects of the film do a good job of keeping the in your face shots to a minimum but deep in the forest and ruins add a depth that is exquisite. However the story is just ok. It does not pull out the same level of emotion as previous films did. Despite the average story it’s well worth a look and earns a green light. Merida (Kelly Macdonald) is a young princess and is forced into marriage by Elinor (Emma Thompson), her mother, the queen. There is a tradition that each family send their eldest son to complete for the right to marry Merida. Merida’s father, Fergus (Billy Connolly), brings together three families to compete for the right to marry his daughter. Merida defies her mother and as first born of her family she claims the right to complete for her own hand. Merida’s defiant act causes a rift in her family and the Kingdom. She confides in an elderly wise woman who turns out to be a witch. With the old woman’s help Merida changes her fate and her mother into a bear. Together they work together to try and undo the spell and repair the damage to the peace among the families. There seems to be no end to the wonderful things technical feats this studio can do. I really enjoyed watching the realism of the hair and fur of these characters. They did a wonderful job of bring to life the lands scape and the people in this world. The directing team of Mark Andrews, Brenda Chapman and Steve Purcell seem to all share the same focus on making these visuals for this film really special. What really socks me is that this team also wrote the story. How can a team of such talented people only bring forth an average story? Steve Purcell’s previous work was about animated cars that moved me more than this story about real live people did. All of them seemed to be more focused on showing us a fantastic setting then telling us a good story. With the average story and all it does break new ground as it focuses on a female lead character who is strong and passionate and completely loveable. The story does focus on how important family is and that communication and understanding are the most important things in families. Heck it made me want to pull my bow and arrows out of storage and go down to the range and fire off a few rounds.